Welcome to one the automotive worlds most exciting weeks. Monetery Car Week. In honor of the prestigious week we will be visiting pre war classics you did’t know you could afford and would be proud to park on the lawns of Pebble Beach. Cadillac. The Standard Of the World. In the 1920’s Cadillac had an illustrious reputation based on the V8 engine. 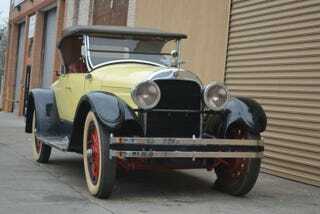 Henry Leland dropped the first American V8 into the Cadillac back in 1915 and for the next decade and a half the V8 and self starter would go on to define the brand. These merits helped add weight to Cadillac’s slogan as the standard of the world. The Cadillac Type V63 was the companies finest car in the mid 1920s. It was the first Cadillac to have front wheel brakes. Brakes on the V63 were not only a luxury but a necessity. The V63 was powered by a 90 degree V8 engine that produced over 80 horsepower at time when the plebeian Ford Model T only created 20. The V63 was for an elite group of people. A car that people aspired to own and helped build the reputation of Cadillac. This beauty and piece of Americana can be bought for $36,500 on Hemmings. Anyone who is looking for a car that they can be proud to peddle down PCH1 need not look further. This classic had the pedigree, class, engineering, and history it match the finest marques ever made. So go buy it before you spend your money on a less unique car like a 57 Bel Air.